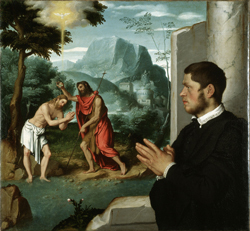 • The works of 16th century artist Giovanni Battista Moroni go on show at the Royal Academy of Arts this week. The exhibition will feature more than 40 works including portraiture as well as his lesser-known religious paintings. They include a number of altarpieces from the churches of Bergamo in northern Italy as well as portraits including Portrait of a Lady (c1556-60), A Knight with a Jousting Helmet (c1556), and The Tailor (1565-1570) – the first known portrait of a man depicted undertaking manual labour. The exhibition in The Sackler Wing, off Piccadilly, runs until 25th January. Admission charge applies. For more, see www.royalacademy.org.uk. PICTURED: A Gentleman in Adoration before the Baptism of Christ, (c.1555-60) (Gerolamo and Roberta Etro). • This year marks 25 years since the fall of the Berlin Wall and the birth of modern Germany so it’s a fitting time for the British Museum in Bloomsbury to host an exhibition looking at Germany’s tumultuous history. Germany: memories of a nation features 200 objects reflecting themes ranging from ’empire and nation’ to ‘arts and achievement’ and ‘crisis and memory’ spanning a period from the 15th century to today. They include Tischbein’s iconic portrait Goethe in der Campagna, an early edition of Grimm’s fairy tales, a home-made banner from demonstrations in late 1989 and Ernst Barlach’s bronze figure Der Schwebende, designed as a World War I memorial for Gustrow Cathedral. The exhibition, sponsored by Betsy and Jack Ryan, runs until 25th January. Admission charge applies. For more, see www.britishmuseum.org. • Britain’s 13 year involvement in Afghanistan is the subject of a new display at the Imperial War Museum London in Lambeth. Opening today, War Story: Afghanistan 2014 features new objects, photographs, film and video interviews and looks at the experiences of the Afghan national security forces and UK government and NGO workers as well as those of British troops. Objects, all collected between 2012 and this year, include a beadwork lamp made by Afghan prisoners in training workshops aimed at developing skills prior to their release and an Afghan dress and trousers. The display is part of the War Story project which started in 2009. Runs until 6th September next year. For more, see www.iwm.org.uk.